Poor finishing and scrappy defending put paid to India's quest for an eighth South Asian Football Federation Cup title as it suffered a 1-2 defeat against Maldives in the summit clash, in Dhaka, on Saturday. India, the defending champions, largely dominated the match with better ball possession and more shots at the opposition goal but the Maldives team scored from the few chances it got to lift the winners' trophy for the second time. Maldives had also won the title in 2008 edition which it co-hosted. Ibrahim Mahudhee Hussain and Ali Fasir scored in the 19th and 66th minutes respectively for Maldives against the run of play. Sumeet Passi (90+2 minute) pulled one back for India in the second minute of the injury time at the Bangabandhu Stadium. India, fielding an Under-23 side except for one player, was chasing its eight triumph in 12 editions and its third back-to-back title. But its forwards failed to put the ball on target on several occasions while the defenders lacked coordination. India had beaten Maldives 2-0 in the group stage. The Stephan Constantine-coached India probably played the worst match of the tournament after making emphatic wins in the group stage and the semifinal. India were going into the summit clash with a lot of confidence after an all-win record and having conceded just one goal in their earlier three matches and was soon dominating the proceedings. In the fifth minute, Nikhil Poojary delivered a looping ball to Salam Ranjan Singh who, however, mistimed his header to waste the chance. It was, however, Maldives who took the lead in the 19th minute with Ibrahim Mahudhee Hussain's right footed shot from the centre of the box past Indian goalkeeper Vishal Kaith from an assist by Hassan Naiz. It was the first time, India was trailing in the tournament. On the backfoot despite having most of the possession, India pressed hard for the equaliser but failed to get one in the first half. In the 30th minute, Farukh Choudhary lost his balance and mistimed his shot from a close range as India missed the closest chance to find the equaliser. The next minute, Subhashish Bose's header off a corner from Anirudh Thapa was fisted away by Maldives gaolkeeper Mohamed Faisal. Striker Manvir Singh, the highest scorer with three goals, then hit the side nettings. The Indian attack came thick and fast but again Farukh Choudhary's pile driver in the 34th minute sailed over the crossbar. Constantine made his first change as Germanpreet Singh replaced Davinder Singh at the resumption. Manvir had a long range try in the 47th minute but it did not create any danger to the Maldives' goalie. A few minuteslater, Maldives goalie made two good saves to deny the Indians who increasingly became frustrated with nothing coming out of their efforts. The Indian hopes were virtually blown away when Maldives added another goal in the 66th minute with Ali Fasir doing the damage. 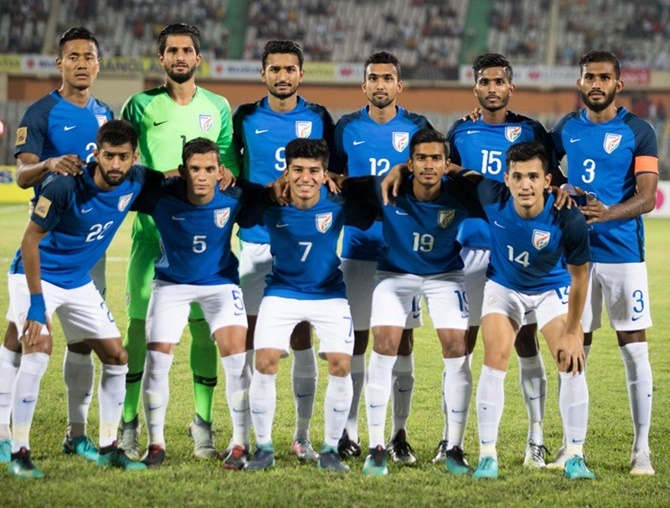 India brought in Sumeet Passi, the only player above 23 years of age, in place of Farukh Choudhary and Hitesh Sharma for Anirudh Thapa in quick succession but a goal still eluded the team. India could reduce the margin in the injury time with Passi finding the net in 90+2 minute but it was too late in the day.